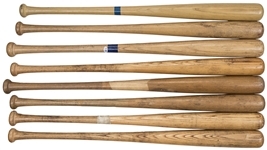 Offered in this lot are eight game used bats from former New York Mets players from the 1960’s and 1970’s, with two of those bat having been signed. The first two bats include a Hillerich & Bradsby S2 model bat that was used by Jimmy Beaumont. This bat has a crack on the handle and Beaumont has signed his name in black marker on the barrel. This bat comes with a COA from Beckett Authentication Services (F63942) for the signature. The second bat was used by Felix Millan. 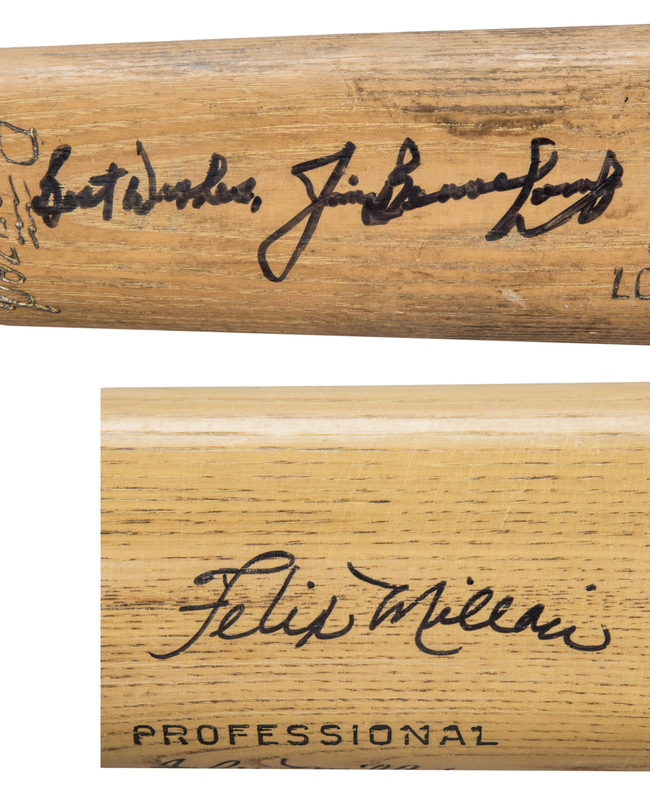 Millan’s Adirondack bat is un-cracked and has been signed by Millan in black marker on the barrel. 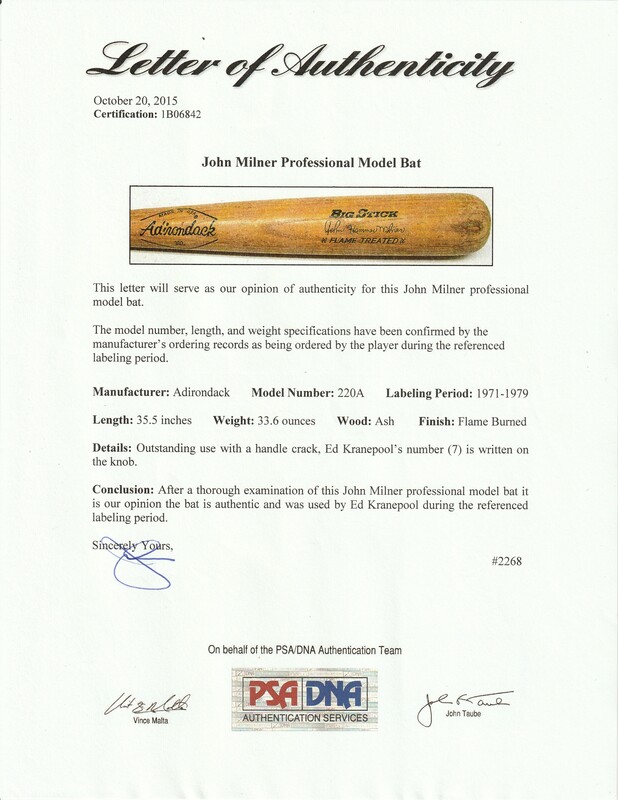 This bat comes with a COA from Beckett Authentication Services (F63941) for the signature. 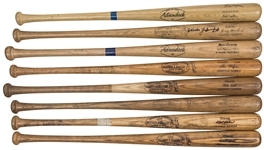 The remaining six bats are all game used bats, but not signed. The first bat is a Hillerich & Bradsby D113I model bat used by Don Hahn. The bat has a crack in the handle. The next bat was used by Pepe Mangual and is a Hillerich & Bradsby S2 model bat. This bat has a crack in the handle. The next bat was used by Mike Vail and is a Hillerich & Bradsby R75 model bat. This bat has a crack in the upper handle that has been secured by nails. 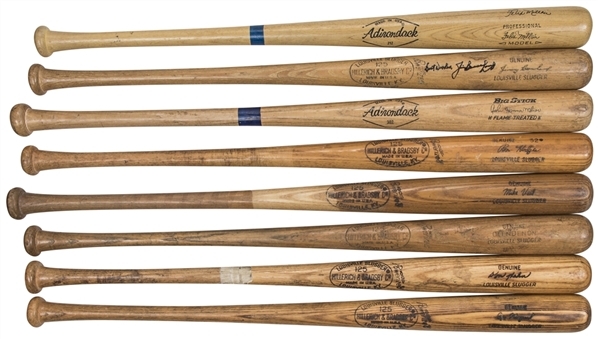 The next bat was used by Ron Hodges. Hodges bat is a Hillerich & Bradsby S2 model bat that has a crack in the upper handle. 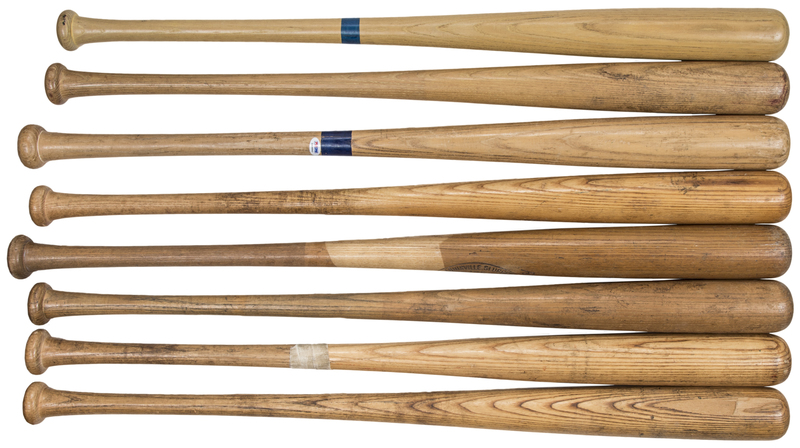 These six bats have been pre-certified by PSA/DNA for the game use. The final two bats include a 1971-79 John Milner game used Adirondack 220A model bat. This bat has a crack in the handle and has Ed Kranepool’s number “7” hand written in black marker on the knob. This bat comes with a LOA from PSA/DNA (1B06842). The final bat was used by Donn Clendenon in 1960. This Hillerich & Bradsby M159 model bat shows excellent game use and has a crack in the handle. It displays checking or grain swelling from repeated ball contact on the barrel. 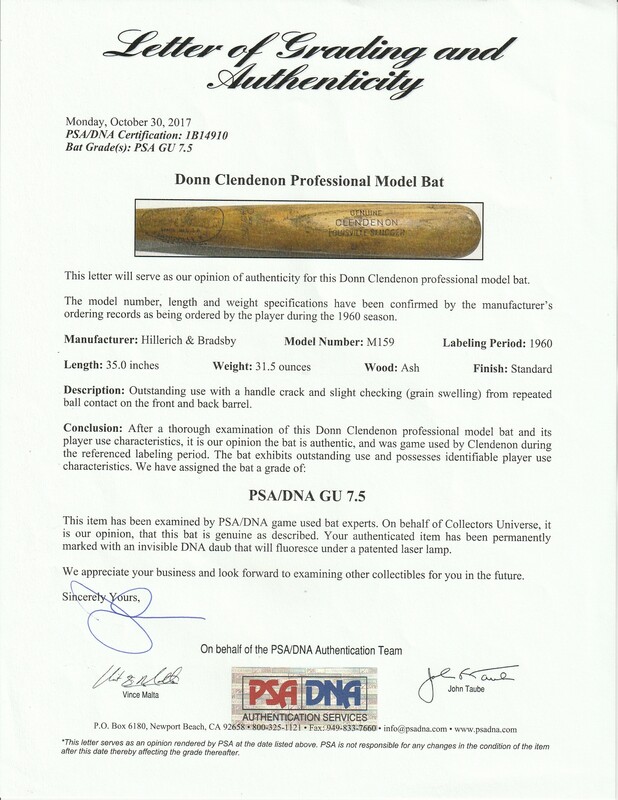 This bat comes with a LOA from PSA/DNA (1B14910) and has been graded a GU 7.5.